With commercial device requirements becoming miniaturized and more stringent, our strict quality control, impeccable machining precision, and a wide variety of material choices will meet and exceed all expectations. In our commercial and industrial machine shop we can produce virtually any quantity of products, ranging from single-item rapid prototype CNC machining to 100,000 mass productions.Our low lead time of 2-8 weeks allows for quick response times to make customer requirement changes. You have no limitations when choosing to work with us! We have the precision swiss manufacturing capabilities to produce parts with a max diameter of 1.5 inches maximum length of 12 feet, and offer you extensive material options to choose from. 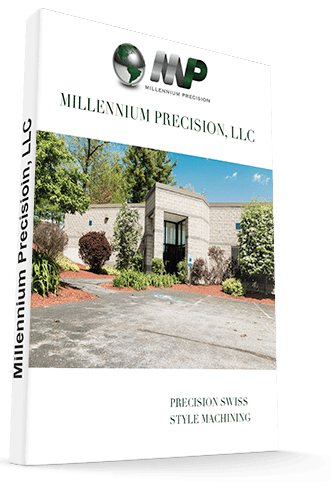 Millennium Precision has the resources to supply turnkey components requiring additional services such as heat treating, plating, grinding, polishing, and electroplating. Over the years we have built a strong network of suppliers in the industry that are always willing to support what our customer needs. Our supplier base is one of the best. Millennium Precision is proudly ISO9001:2015 certified,which guarantees stringent quality control standards. We guarantee that no part from our industrial component fabrication floor will exit the building without a meticulous inspection to ensure that the product meets and exceeds all requirements.